Yesterday morning, the farmers were so cold that they had to pass the time by having a catch (or playing catch, depending on where you’re from) with a sweet potato and tongs. I am so thankful that they come out no matter the weather. The sweet potatoes and scallions in this recipe are from that market. Not only does this recipe highlight winter vegetables, but this was also a good way to use up some cans of beans that seemed to be multiplying in my pantry. I used a recipe from Real Simple which was made for slow cookers. Since I don’t have a slow cooker, the cooking times are changed. I also used fire-roasted tomatoes with spicy chiles, but the recipe does not call for the spicy kind. 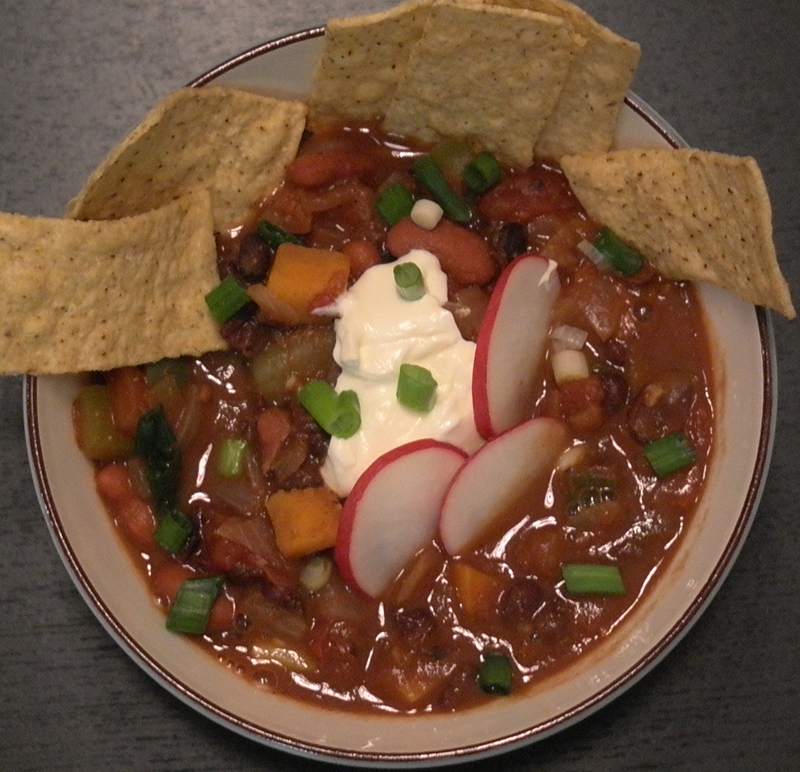 As with most chili, this one gets better the next day or the day after that. I like to make a big batch, and then heat some up the next morning to put in my thermos. I love this one for work because it even comes with its own little folding spoon…how adorable! Keep the “fixins” in a separate container so they don’t get soggy. It makes for a much more exciting lunch than pb&j. In a large pot over medium heat, combine 1 tablespoon oil, the onion, and the sweet pepper. Stir occasionally until onions are soft, about 5 minutes. Add the peppers and cook an additional 2 minutes. Add the garlic, chili powder, cumin, cocoa, cinnamon, 1 teaspoon salt, and ¼ teaspoon black pepper. Stir constantly until fragrant, about one minute. Add the tomatoes, beans, and 1 cup water. Cover and cook for 20-30 minutes, until potatoes are tender. Serve with thinly sliced radishes, sour cream, scallions, and tortilla chips.